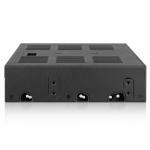 If you’re seeking a compact rack with versatility and functionality, we have a convenient enclosure just for you. 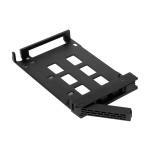 The ExpressCage MB322SP-B is a mobile rack that converts a external 5.25” device bay to fit two 2.5” SATA/SAS HDD/SSD (5mm-9.5mm), and includes a 3.5” slot for either a hard drive or a 3.5” device. 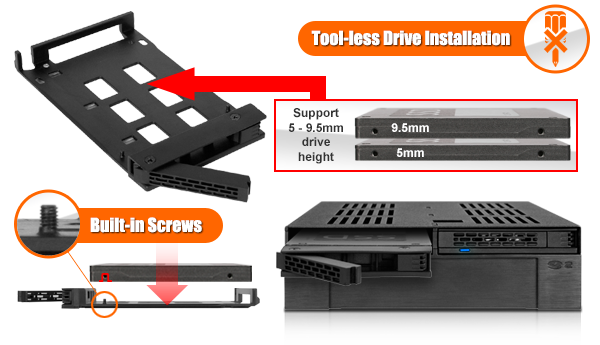 With the unique tool-less drive installation design, the ExpressTray Mini allows you to install your 2.5” SATA or SAS HDD/SSD just as quick and simple as a tray-less system while the optional bottom tray screw holes provide added stability. 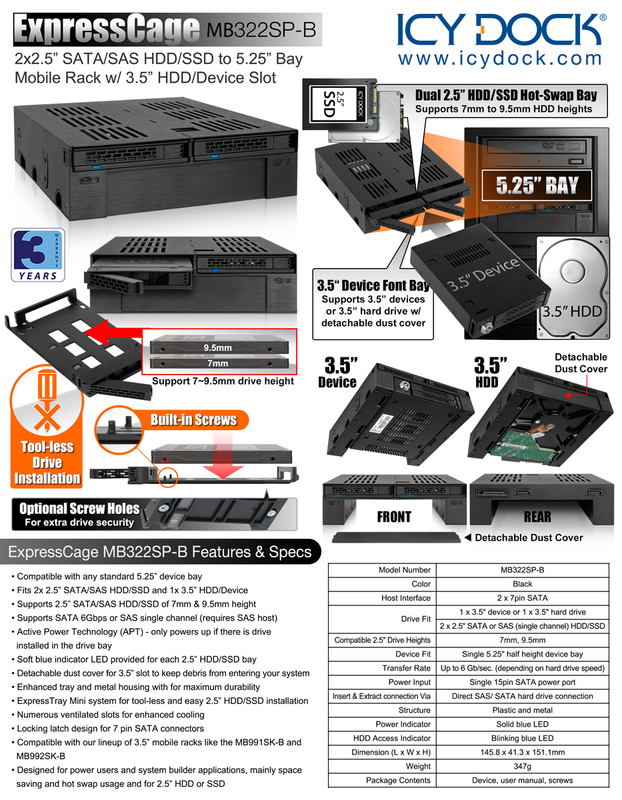 The MB322SP-B has a detachable dust cover which keeps the front panel enclosed to block out dust particles when the 3.5” slot is left unused or when there’s a 3.5” HDD installed. Soft blue LED indicator lights on each 2.5” drive bay notify you when drives are being used without being too distracting. For maximum durability we have implemented enhanced door latches and a solid metal housing. 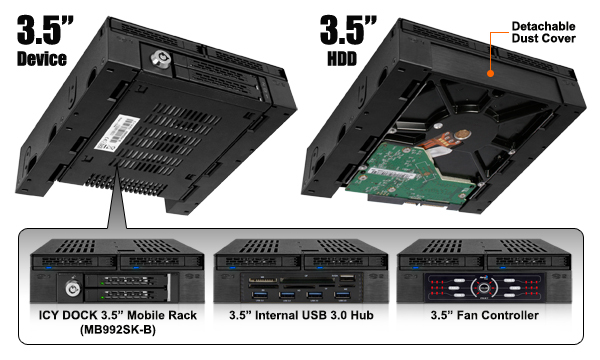 Not your typical 5.25” mobile rack, the ExpressCage MB322SP-B *takes two 2.5” SATA/SAS HDD/SSD of 5mm to 9.5mm height and converts them into two hot-swap drive bays. 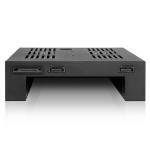 It also includes 3.5” slot for a 3.5” device or 3.5” hard drive for various build options. 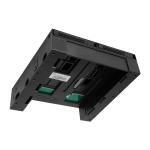 The MB322SP-B’s 3.5” slot for 3.5” HDDs or 3.5” devices comes with a detachable dust cover that not only protects your devices from dust and debris but also blends in with your system. So if you decide to leave the 3.5” slot empty or you have a 3.5” HDD for additional storage, the dust cover provides a visually flowing look while preventing dust from entering the system. 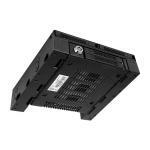 The ExpressCage also comes with a metal cover finish for robustness and numerous ventilated slots for enhanced cooling. 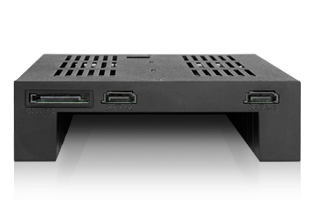 Each bay has its own indicator light to notify you of any hard drive activity. Soft-blue LED makes it easier to sense when drives are in use without straining your eyes. 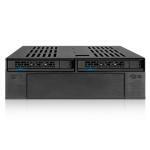 Any system requires data storage whether it’s a tiny flash memory for storing firmware, an 8TB hard drive for storing your movie collections, or a bunch of SAS drives daisy chained together for a file server setup. 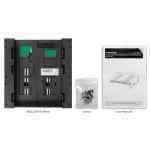 The requirement of data storage varies depending on the application and system. 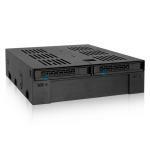 The ExpressCage is specifically designed for applications that require hot-swapping hard drives or solid state drives on a daily basis. 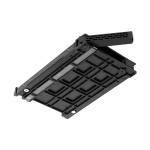 The unique ExpressTray design allows you to easily install the hard drive or solid state drive onto the tray without using any tools. Simply slide the ExpressTray into the ExpressCage and you are ready to go. 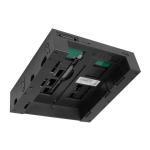 The ExpressCage supports different 7mm to 12.5mm height SSD and HDD with its internal smart pad and built-in screws which gives you both convenience and reliability. 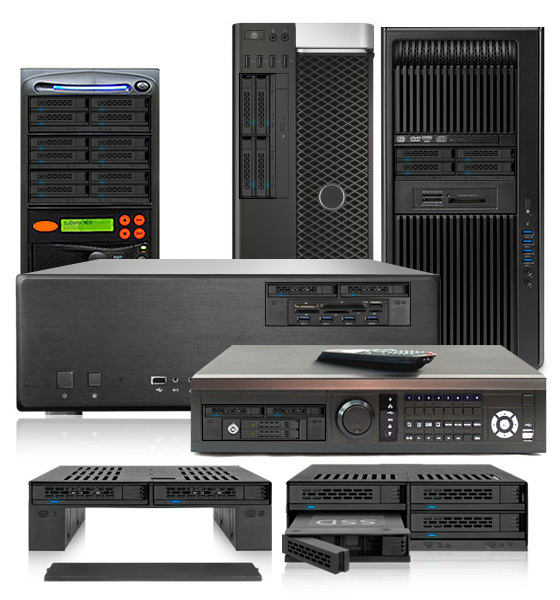 The ExpressCage is recommended for data backup systems, HDD/SSD cloning, surveillance/DVR system, media workstations and home theater systems. 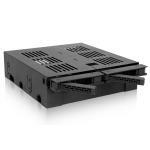 "The Icy Dock MB322SP-B is a differentiated offering combining 2.5" tool-less hot swap with a 3.5" internal/ external bay. 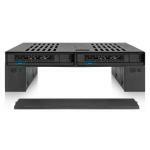 If one has a need for this combination, ExpressCage makes this a solid solution." "Today I've got two cages from Icy Dock. The ICY Dock ToughArmor MB996Sp-6SB and ExpressCage MB322SP-B."